I think in our culture we often confuse acceptance with forgiveness. Forgive and forget is our mantra, but what about the woman who has been raped, what about the child who has been abused by the ones who were supposed to show Jesus to them, what about the lies that are told and reputations that lay trampled on, beaten into the dust? It doesn’t work - forgive and forget - because God never told us to do that. It’s a made-up idea, a valiant effort at loving brave, but when it’s some guy’s idea and not God’s (especially where forgiveness is concerned) it is sure to be a bust. God forgives and forgets. This is important. We cling to that promise because without God’s ability to set our dark stuff aside, send it far away, we rob ourselves of the Hope God intended for our weary souls. “He remembers that we are dust” in the Psalm above means God remembers we aren’t capable of fleeing our dark stuff and the dark stuff other people put on us. He remembers we are not God. He remembers we are people. He remembers we are people in need of grace. Love remembers, and still forgives. Love remembers and lets Christ pour on grace lest it destroy us. When memories well up of people and their hurtfulness, their mistakes, their abuses, I can berate myself for being a person, for letting the pain back in, for dragging my list back out, or I can let God do His Love Brave work. Letting those brave prayers out before the God who is capable of forgetting puts what wants to live and grow inside of us like a cancer on the outside, instead of ruminating and building resentment within us. God’s brave ability to hear us, hear our pain, hear our struggle against clinched fists and frustration lifts the weight of resentment from our chests onto His. His shoulders are wide enough. His hands have holes in them, ready to soak up what we cannot. Our forgiveness may happen moment by moment, step by baby step, especially on the big, hard stuff. 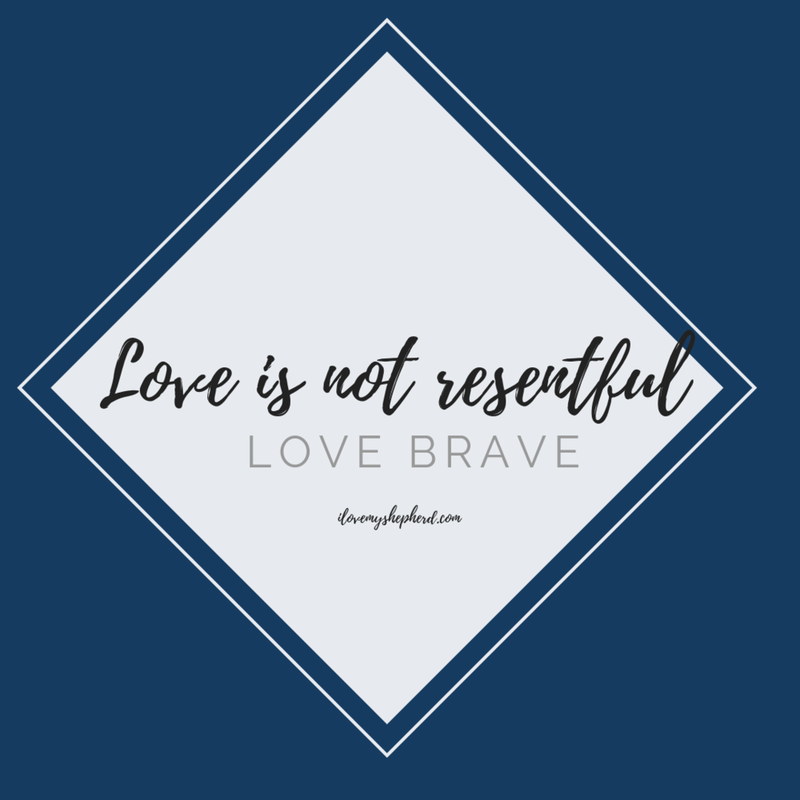 That doesn’t make it less valid, less brave, or less full of love. God, love brave when I cannot. Love deep and wide and do not let this eat me up inside. There are many things worthy of resentfulness in this world, but none worth holding. Holding the junk other people bring into our lives becomes anxiety roiling in our stomachs, or that weight on our chests, or the pounding headaches pressing down. God can hold it; we don’t have to. Here Ya go, Lord…again and again and again. That is Love is not resentful. I remember listening to a sermon once, and the preacher shared these words: “The sin you cannot forget, God cannot remember.” God knows all. There is nothing in the past, nothing in the present and nothing in the future which is a surprise to Him. He’s all-knowing, omniscient. Yet, he promises us in Isaiah: “I am he who blots out your transgressions for my own sake, and I will not remember your sins.” I will never be able to forgive and forget like God, but when I remember the past hurt and pain, I can also recall His forgiveness for me. It’s my prayer, when I’m holding on to pain and hurt, that God can help me let go. It’s my prayer that He can begin to heal me as He will fully on that last day.